Add salt and rice to 4 cups of water and bring it to a boil. Drain out excess water and allow it to cool. Parboil the vegetables in salted water, drain out the water and keep it aside. Marinate the parboiled vegetables in ginger-garlic paste. Add some curd for a smooth consistency. Add 3 tsp of biryani masala and keep it aside for an hour. Add ghee in a heavy bottom pan and sautè the marinated vegetables for 3-4 minutes on a slow flame. 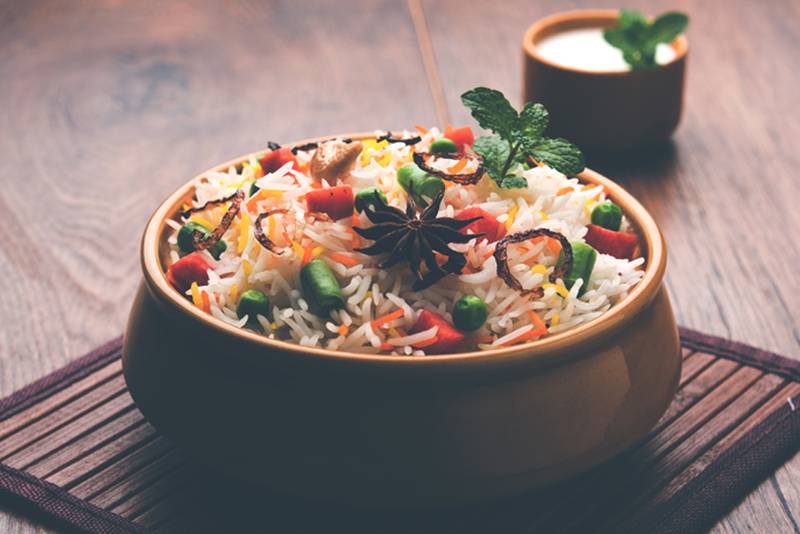 Place half of the sautèed vegetables in a heavy bottom pan and layer the mixture with rice. Sprinkle the remaining biryani masala, fried onions, cashews, raisins and saffron milk. Repeat the whole process of layering. Cover it with a lid and place a moist cloth on top. Seal the sides of the utensil with dough. Put the pan on a pre-heated tawa and cook on a slow flame for 15-20 minutes. Serve hot.